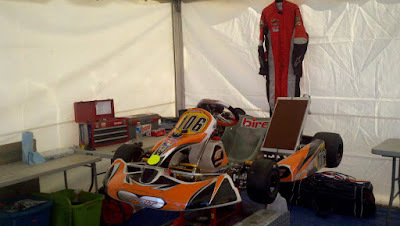 The first eKartingNews.com Driver Rankings of 2011 came out last week. 2011 will be the first year I am included in the rankings because I am running the Southwest Regional Cup. My points in this series will count for the EKN national ranking. The EKN ranking counts your best 6 National/Regional events (see below for more details), but I only have two events counting for me so far. Currently, I'm in 100th place in the Stock Moto class but hopefully I can climb the ranks this year as I get more events under my belt and continue to improve. 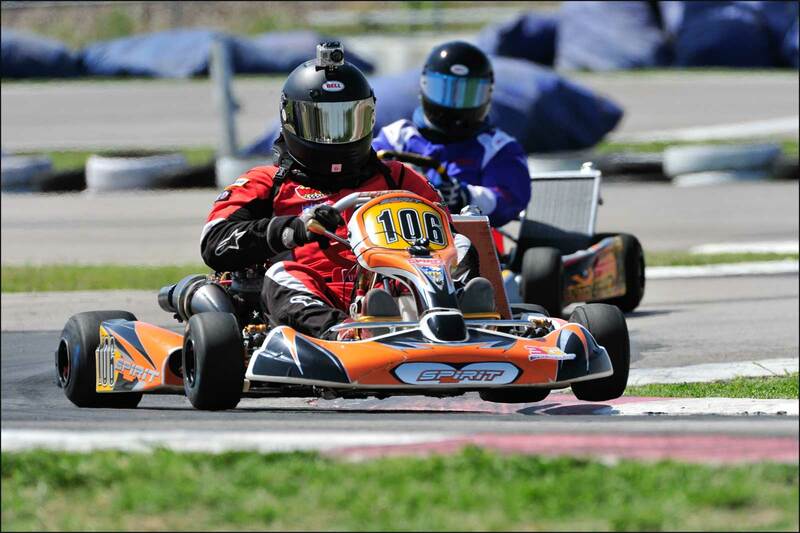 The EKN Driver Rankings are calculated using a driver’s best finishes in major North American races. Assembled using events from the previous 12 months from the current date, we use a driver’s best seven finishes in TaG and six in Stock Moto to determine their overall current point total. With each new release, results posted from more than one year ago are discarded. To deliver our ranking list, we tabulate the results of all the national programs and selected regional programs. We have included the results for the major one-off events such as the SKUSA SuperNationals, the US Rotax Max Challenge Grand Nationals, the Rock Island Grand Prix and the Streets of Lancaster Grand Prix. Each race is initially weighted based on the prestige and history of the event or series with a score of ten (10) being the highest attainable base ranking. 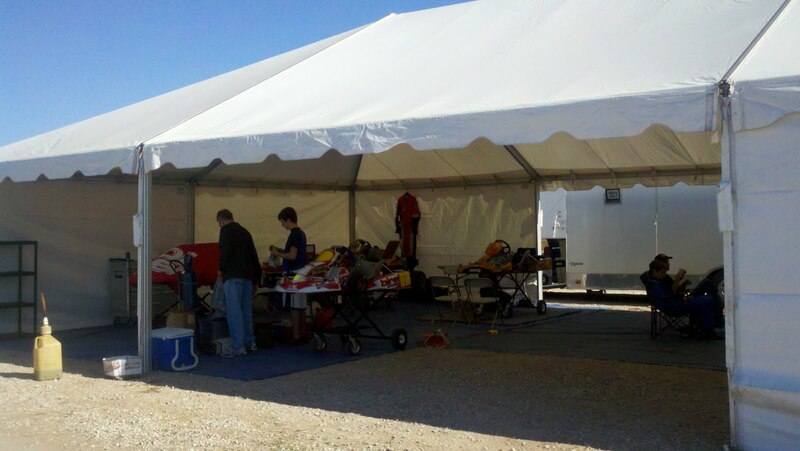 For 2011, the SKUSA SuperNationals and US Rotax Max Challenge Grand Nationals receive a score of 10 in their initial weighting in the TaG category while the SuperNats is the lone event in the Stock Moto division. 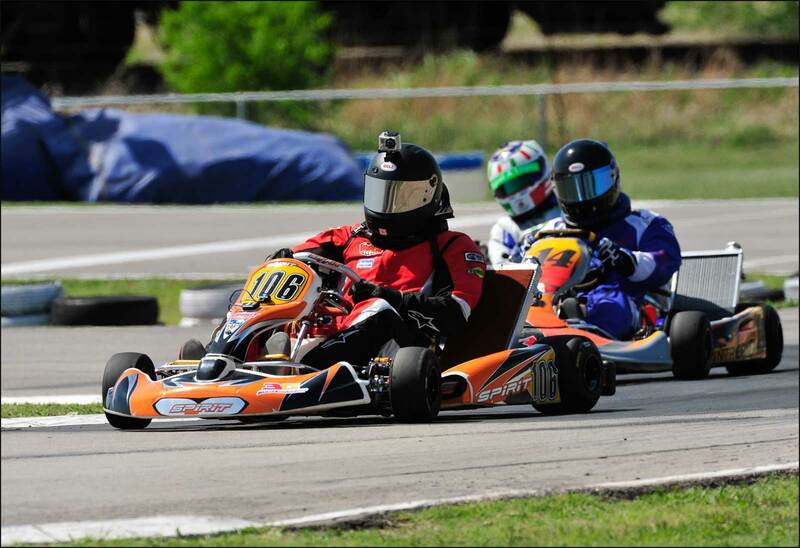 The SKUSA Pro Tour and Rotax Pan American Challenge national series events draw a base ranking of nine (9), while the WKA Manufacturer’s Cup, Florida Winter Tour, Challenge of the Americas, IKF 2-Cycle Sprint Grand Nationals and other regional program races were given a base ranking of either eight (8) or nine (9). 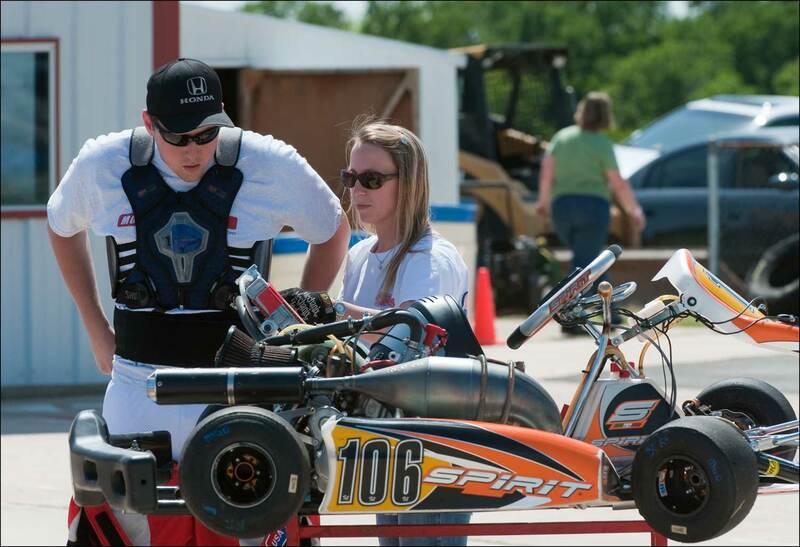 The EKN staff reserves the right to adjust the rankings of each event throughout the year. 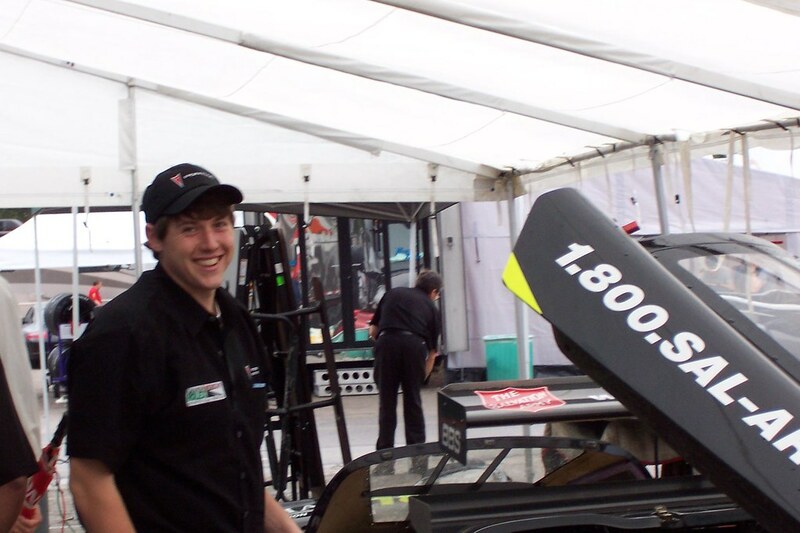 Continuing for 2011 is a minimum entry total for any events considered for the Driver Rankings program. If an event does not have at least five (5) drivers starting the race, those results will not be tabulated toward the Driver Rankings. My friend Vu Banh snapped this cool photo of my Mazdaspeed Miata with the Wildcat Wildfire in the background. The photo was snapped on the outskirts of San Angelo, TX. The Wildcat fire is 80% contained as of this morning and has burned more than 150,000 acres. I raced with the North Texas Karters this past Saturday in Denton, TX. It was great karting weather and Ali and her family joined me for the day which was a huge help. To keep the budget down, I am trying to save all of my used SWRC tires to use for NTK club races. 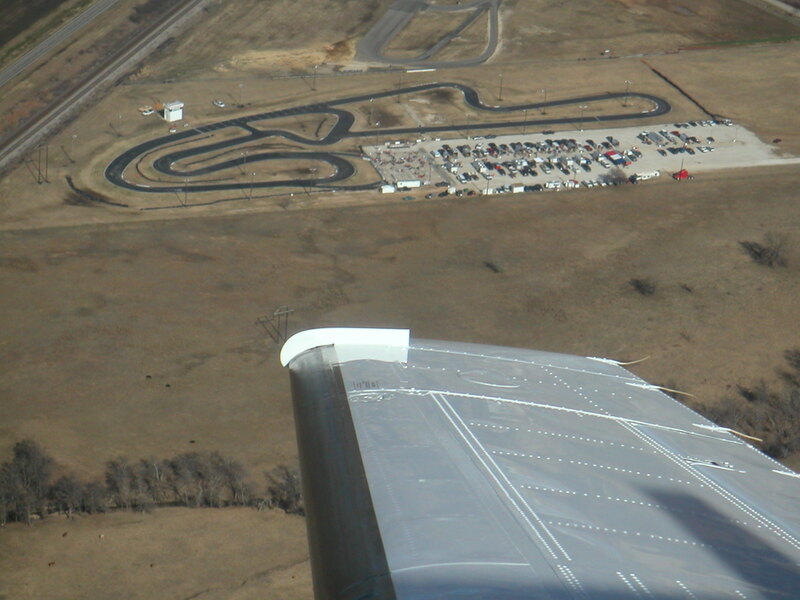 Oklahoma Motorsports Complex has high tire wear, so my tires were close to the wear bars at the start of my event. This worked OK, but I could have used some new tires as I had to keep mounting and swapping tires to keep four decent ones on the kart. Despite this, I was able to lower my personal best time around NTK by 0.2s. 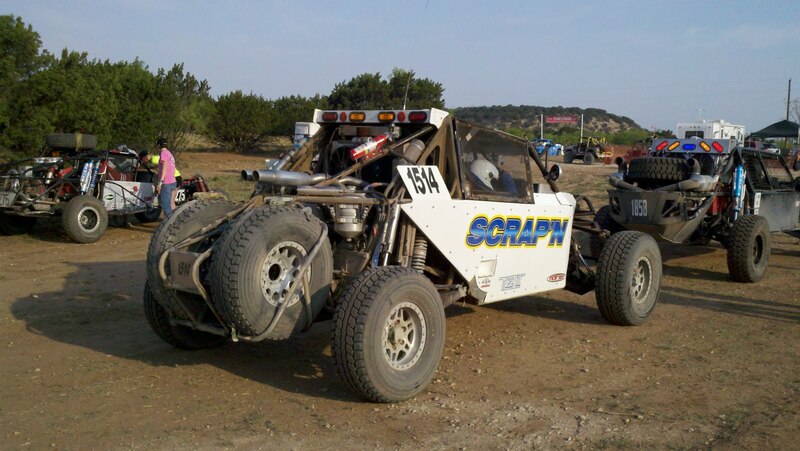 I ran about 45 laps during the day which will be good preparation for the SWRC race at NTK in May. Qualifying started at 1PM on Saturday and I was able to secure pole position for the heat race with a qualifying time of 37.74. 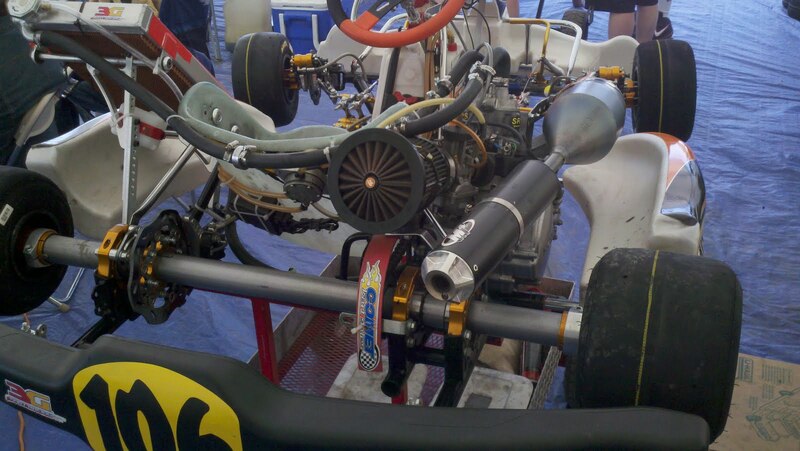 This was a few tenths off of my fastest practice lap, but still got the job done. 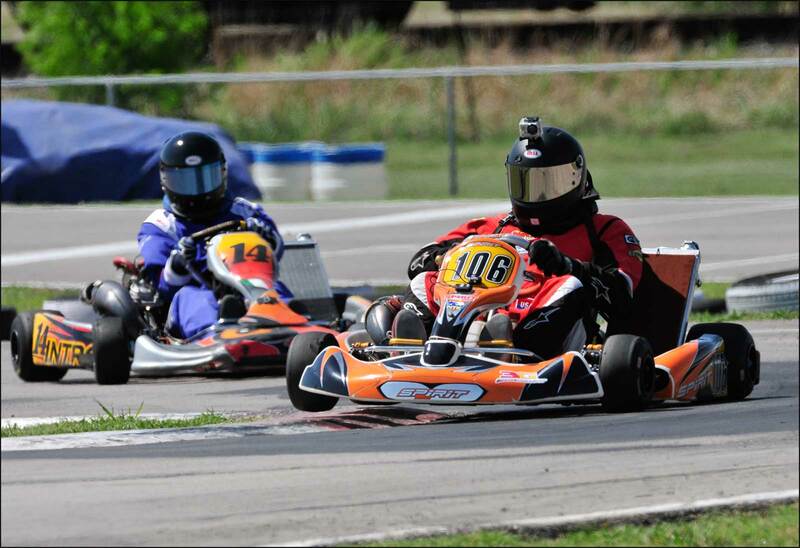 In the heat race, I was passed by Andrew Perkins in the CRG kart on Lap 2 of the 8 lap race and he checked out. 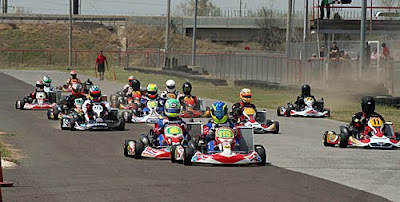 With two karts directly behind me for the whole race, it was an exciting race and I was able to cross the line in 2nd place. culprit was as I saw my right rear tire folded up in the center of the wheel. At mid-corner of a 2G 50mph corner, my right rear tire de-beaded causing me to lose all rear grip and lose control. 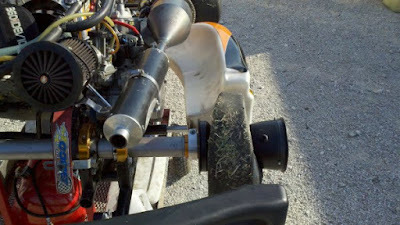 Luckily, I was fine and the kart was not damaged, but my race was over. It was a disappointing end to a fun day these things happen in racing. I got the kart prepped over the past few nights and am loaded up for NTK Spring Race #3 at North Texas Kartway in Denton, TX. I will be racing my #106 Spirit SP32 Stock Moto Shifter kart. Practice starts at 9AM with qualifying and races starting at 1PM on Saturday. My two 6th place finishes in Norman put me in a tie for 5th place overall in the S2 class. 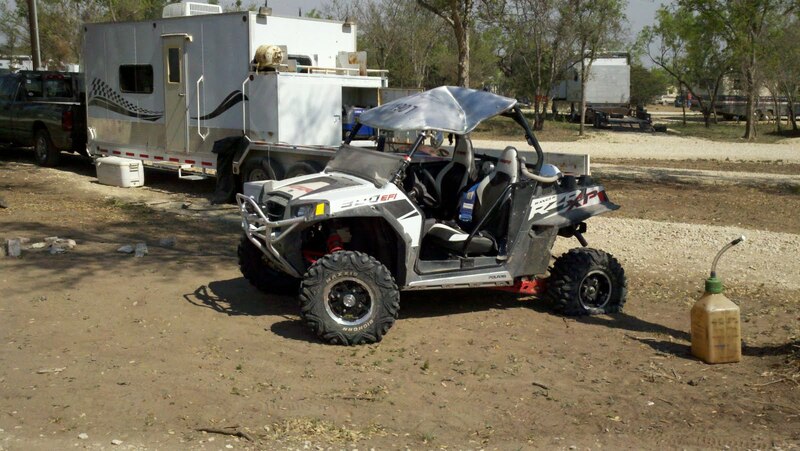 Ali and I made the trek with a few friends to Blackwell, TX for the Blackwell 250 which is the first round of the Baja Racing Texas series at Texana Off-Road Ranch. I've been into Baja and off-road racing since my Baja SAE adventures in college so the chance to check out this race less than an hour from my house was too hard to pass up. 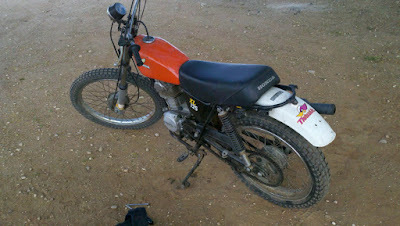 We loaded up the dirt bikes in the truck, but this was futile as we weren't allowed to roam the 38 mile course without being a "crew-member" so we were confined to the large paddock area...so only the pitbike was really needed. Anyway, there were about 50 cars running the race and the start was fun to watch as all 50 cars rocketed off the line at 30s to 60s intervals. 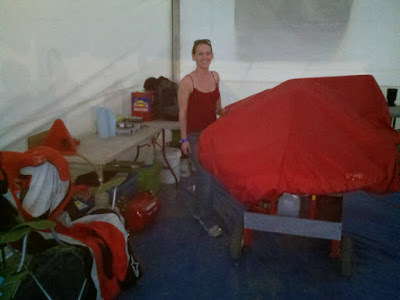 We watched for several hours and roamed the pits talking to racers and peering into crashed racecars. Before the 9 hours Blackwell 250, there was a two-hour UTV race the paddock had approximately 80 to 100 cars in it....so there were many different types of racecars to snap photos of. We left the ranch around noon, and after a quick lunch and workout, I went to the shop and hopped into Gary's truck headed for Odessa. 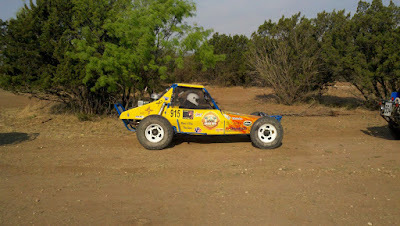 Gary and I left around 4PM for his Saturday night Sprint Car race in Odessa, TX. 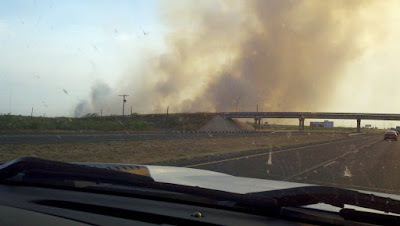 During the two-hour drive to Odessa, we saw a huge wildfire that filled the sky with white and black smoke. 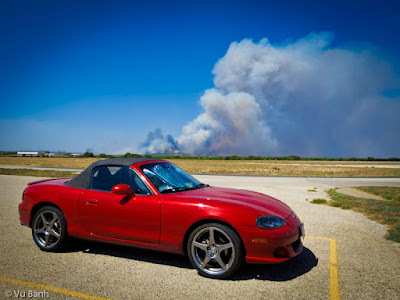 I later read that it has consumed over 4,000 acres and destroyed 34 homes...scary stuff. The track conditions in Odessa were pretty terrible as the temperature reached 100 degress before sunset, with 30mph winds, and a very dry dusty track. We tried some different setup options during the hot laps but we were struggling with rear grip center off. After the pill pick for the heat race, we started 6th out of 6 for the heat, but Gary made several nice passes and moved into 3rd place. After another pill pick to jumble up the top 6 for the Final, Gary drew P4 so we lined up on the 2nd row for the 20 lap final. 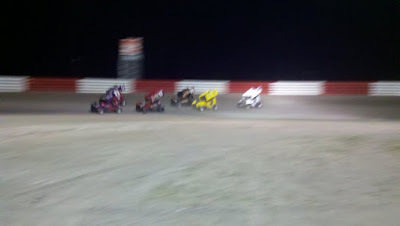 Being his only crew-member, I bump-started him with the ATV and quickly moved to the infield to watch the 20 lap battle. 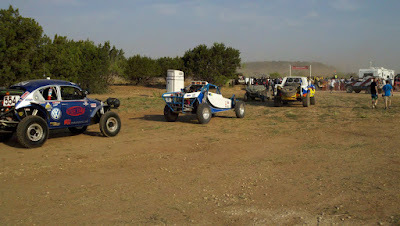 The track was terribly dry and the windy conditions made the track a dust bowl. Visibility was non-existent but Gary was able to stay clean and move up to 3rd place by the checkered flag. Garry took home $250 in prize money and we got home at 3AM. After 6 hours in the car, and watching dirt track racing from 8AM Saturday to 3AM Sunday, I was exhausted and fell asleep on the couch watching F1 live....fun Saturday. Race 1 of the Southwest Regional Cup is in the books. We had a solid field of S2 Stock Moto Senior shifter pilots out today with many national caliber karters in the class. I qualified back in the field in 11th place, but worked my way up to 8th place in the Pre-Final and 6th in the Final. This is a solid points start to my season as I learn and get quicker throughout the season. My kart has held up well with no major issues. This has allowed me to tune the kart and focus on my racing. Race 2 will be tomorrow afternoon and then the best part of the weekend...my 6 hours tow back to San Angelo. I'll post Sunday's recap next week once I get back home. 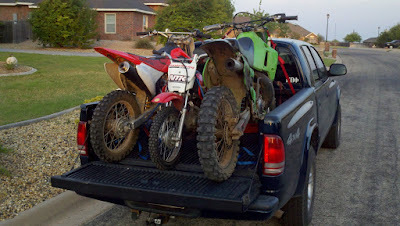 Not looking forward to the long drive home tomorrow after racing....Monday's going to be rough at the office.